The French home-security manufacturer's standalone camera is more attractive than most, but it handcuffs users with limited management options. The MyFox home-security camera can operate on its own or as part of the Myfox Home Security System, a product that initially impressed but ultimately disappointed us due to the system’s limitations. The company’s camera is burdened by some of the same concerns, and it feels a few iterations away from holding its own with similarly priced security cameras. The MyFox camera sits inside a cylinder about the diameter of a drink coaster, which rests on edge atop a plastic base. While you can change the vertical angle slightly by rotating the camera up and down on this base, there’s no side-to-side swivel—you must reposition the entire unit to change its horizontal viewing angle. The camera comes with a long power cord that gives plenty of leeway for positioning it away from power outlets. It also has an internal battery that will keep the camera rolling for an hour if there’s a power outage. MyFox sends an alert to your phone when the power goes out, and again when it’s restored. If it loses its connection to the Internet, the camera will record footage to its internal memory. If you pay for continuous recording service, it will transfer the video to MyFox’s servers when the connection is re-established. MyFox features streams in 720p with a 130-degree wide-angle lens and night vision up to 5 yards. It also boasts a two-way intercom that’s activated from the MyFox app. The purple bars in this scrolling timeline in the MyFox indicate security events in MyFox’s live feed. The MyFox camera’s most compelling feature is a motorized shutter that’s controlled from the MyFox app and covers the lens whenever the camera is turned off. It’s a feature that’s surprisingly assuring given the privacy vulnerabilities that have been discovered in many webcams and other home-monitoring devices. While the camera provides a live feed out of the box, you need a subscription to one of MyFox’s cloud-recording services to store video in the cloud. For $5 per month you get one day of video history; $10 per month gets you an entire week of storage. MyFox is currently offering a free two-week trial with the second option. Given the French manufacturer’s experience in home security, you get the expected level of care with your data. Video transmission between the camera and the cloud uses a 2048-bit SSL encryption key, and video streams are encrypted with 2048-bit Transport Security Layer (TLS). The same encryption level is used when connecting your smartphone to MyFox cloud. All videos are stored with AES-256 encryption. Setting up the MyFox is fairly simple: once you downloaded the app, it walks you through the process for creating an account, entering your Wi-Fi information and and adding the camera to your network. The whole thing took about three to four minutes. MyFox’s 720p video is pretty standard in this price range, and it’s crisp and clear with moderate fish-eyeing in smaller rooms. It remained that way when switched to night mode, and there was minimal distortion when using the 4x “magic zoom” on the image in either mode. In addition to the power and Internet outage alerts, MyFox sends you a notification if the camera detects motion. Unlike with some other cameras, MyFox doesn’t offer a way to adjust the sensitivity of the motion detection, so I was getting alerts every few minutes because one of my cats moved in proximity of the camera. It was annoying enough that I eventually turned the motion detection off. I tested the mic while I was in the house and the audio was plenty loud but buzzy, with no improvement even when I held the phone farther away from my mouth. The sound from the live feed was actually much clearer, and I could easily make out conversations the camera picked up when I was in another room. The MyFox Security Camera’s privacy shutter is an effective feature for thwarting snoops. 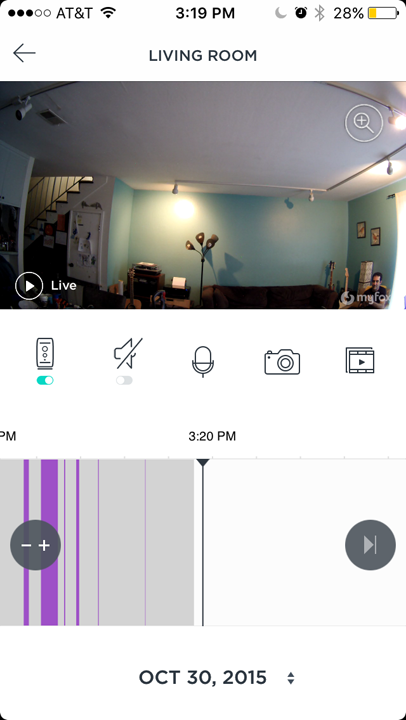 You access your live feed by selecting your camera from from the MyFox app’s home screen. The feed screen looks much like the one for Simplicam’s app—the feed appears at the top. Beneath that, you’ll find controls for the privacy shutter, microphone, and speaker, and a button to take screenshots of your video feed that are saved to your phone’s camera roll. Under these is a scrolling timeline where security events are recorded as purple bars; you just scroll the timeline back to one of them to view that event’s video footage. Despite this labyrinthine menu, the app doesn’t offer much in the way of camera customization options. 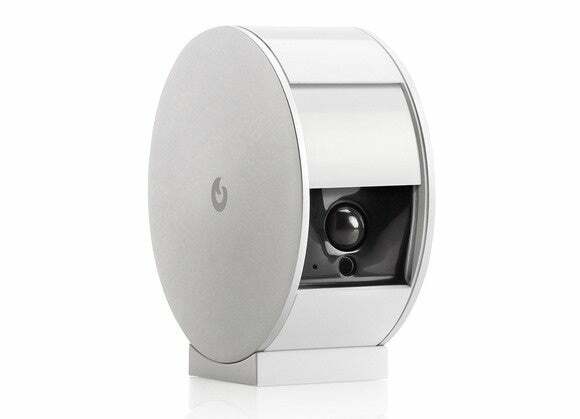 Every function—motion detection, night vision, HD video—comes with basically two options: on or off. Several comparably priced cameras allow you to set motion detection areas or to change the intervals at which you receive alerts to reduce false alarms and nagging notifications. None of those were available with this camera. I asked a MyFox representative about this and was told that scheduling options and the ability to manage notifications are currently available only to customers who use the camera as part of its full MyFox security system. The spokesperson said the company is working on making notification management available to customers who purchase the camera on its own. Finding your way to the settings the MyFox camera does have is something of a challenge. One would logically assume they’d be under the menu header “settings,” but this contains just one control: a button to deactivate the automatic opening and closing of the shutter. To find the rest, you must tap the menu button and follow the path System > [camera name]. It’s hardly intuitive, and I found the app to feel unfinished. The MyFox security camera is a solid piece of hardware. But the app, with it’s lack of customization controls and muddled menu layout, really limit it as a home-security solution. The camera’s privacy shutter is its strongest feature by far. Knowing someone can’t remotely hack their way into my living room when I’m home because the lens is covered helped me feel more at ease. If only the camera made me feel that secure when I was away from home. The camera is solid but it’s handcuffed by a lack of customization controls and confusing app that limit it as a home security solution.